2015 was a great year for books on Medievalists.net, and 2016 promises to be better. Of all the books I read over the past twelve months, these five books were my favourite reads of 2015. The books are not in any particular order, I would be hard pressed to pick a favourite. Four are fiction, one is not, but that book tells the story of a wondrous city like a good yarn. 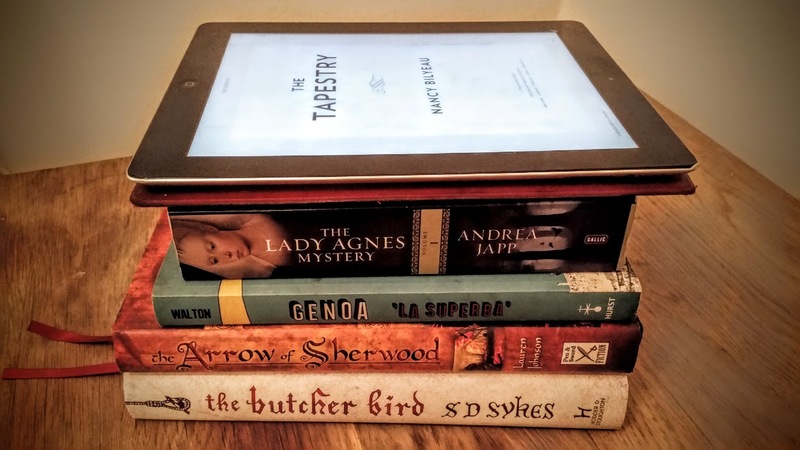 One book on this list is really more of a Tudor addition but was a fabulous read I reviewed for the site so I couldn’t disregard it as one of my top picks. My resolution to you is that 2016 will be the “Year of the Book” on Medievalists.net. I’m an avid reader, an ex-pat slowly rebuilding the library I had to leave behind when I moved across the pond, so I will take you along on that journey with me. There are truly few things better than a good book. Read on, and enjoy! Genoa has an incredible story to tell. It rose from an obscurity imposed by its harsh geography to become a merchant-pirate superpower that helped create the medieval world. It fought bitter battles with its great rival Venice and imprisoned Marco Polo, as the feuding city-states connected Europe to the glories of the East. It introduced the Black Death to Europe, led the fight against the Barbary Corsairs, bankrolled Imperial Spain, and gave the world Christopher Columbus and a host of fearless explorers. Genoa and Liguria provided the brains and the heroism behind the Risorgimento, and was the last place emigrants saw before building new lives across the Atlantic. It played host to writers and Grand Tourists, gave football to the Italians, and helped build modern Italy. Today, along with the glorious Riviera coast of Liguria, Genoa provides some of the finest places on earth to sip wine, eat pesto and enjoy spectacular views. This book brings the past to life and paints a portrait of a modern port city and region that is only now coming to terms with a past that is as bloody, fascinating and influential as any in Europe. Once again, we’re back to fourteenth century England, with former monk, now bumbling lord and medieval crime fighter, Osawald de Lacy, ready to quell another murder in the sleepy Kentish village of Somerhil, in SD Sykes latest book, The Butcher Bird . Oswald has another mess on his hands as angry villagers are demanding higher wages in the wake of the Black Death. Facing a shortage of workers, while also being pressured by King Edward III’s 1351 Statute of Labourers, Oswald is between a rock and a hard place. He wants to raise wages but can’t get caught or he will face the wrath of the royal courts. If he doesn’t raise the wages, he risks losing his labourers and watching his newly inherited estate crumble. As all this is unfolding, and the dissenting voices get louder, a murder is thrown into the mix. “Robin of Locksley is a murderer. A wastrel. A disappointment to his mother, a humiliation to his father and a disgrace to the entire county. We have all known it for many years, but out of respect for his excellent father, we have refrained from admitting it. We can no longer stand mute. For eighteen years, this boy has led a life of selfish ease and sin. I shall tell you something of this young man, a secret I have kept to myself for weeks but now know I must reveal. Then you will see how undeserving this boy is of forgiveness…”1193. A Crusader returns from the Holy Land to his home in Nottinghamshire, where he is known as a murderer and outlaw. His name is Robin of Locksley.After a youth spent with lowborn friends, Robin is determined to settle into the role his father wanted for him: a lord dispensing justice to the county. But a false rumor of his death in the East has stolen Robin’s lands from him, and the country he left only four years before is now crippled by taxation and struggling to maintain the King’s law. It seems Robin must choose between his desire to regain his lost inheritance and his intention to help the commons beneath his lordship.In this vividly imagined and carefully researched recreation of the era of King Richard ‘the Lionheart’, England is torn between the landowning Norman lords and their English subjects, and it soon becomes clear to Robin that more can be accomplished outside the law than within it…In her first novel, Lauren Johnson brings the sensibilities of a historian to the project, presenting us with an authentic depiction of the sights, sounds, conflicts and furies that defined this era and those at home within its confines. A story of redemption, loss, romance and adventure, the novel possesses all the component features necessary to enthrall. 1304 The Church and the French Crown are locked in a power struggle. In the Normandy countryside, monks on a secret mission are brutally murdered and a poisoner is at large at Clairets Abbey. Young noblewoman Agnès de Souarcy fights to retain her independence but must face the Inquisition, unaware that she is the focus of an ancient quest.